Arum esculentum L., Caladium esculentum (L.) Vent., Colocasia antiquorum Schott, Colocasia antiquorum var. esculenta (L.) Schott, Colocasia antiquorum var. euchlora (K. Koch & Sello) Schott ex Engl. 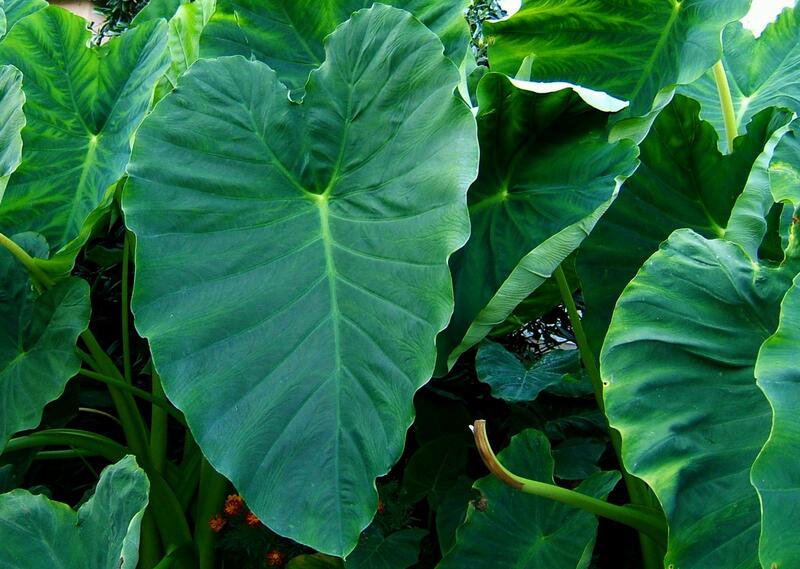 The taro (Colocasia esculenta (L.) Schott) is an herbaceous perennial, mostly cultivated as an annual. It grows up to a height of 2 m. Its adventicious and shallow root system arises from the corm, a swollen underground stem that contains high levels of fine starch and weighs up to 1 kg. Corms are usually cylindrical and 30 cm long x 15 cm diameter, but they are highly variable in size, shape and colour. The leaves are 30-90 cm long and 20-60 cm broad, and are borne in crowns at the end of upright, thick, succulent, 0.9-2 m high petioles. 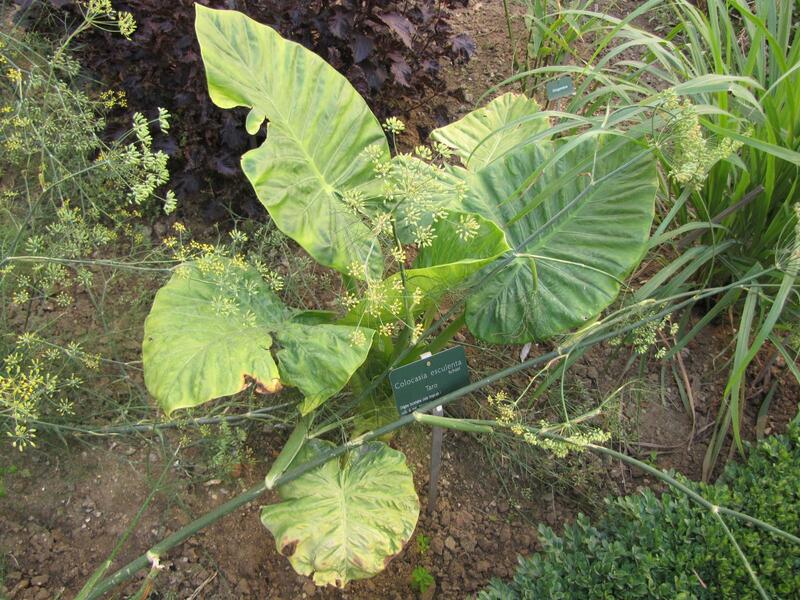 The inflorescence is a large pale green spathe (Ecoport, 2010; Safo Kantaka, 2004). There are hundreds of taro cultivars. Dasheen taros are wetland cultivars, mainly cultivated in Asia and the Pacific Islands. They have a single and large mealy corm (Ecoport, 2010). Eddoe taros are dryland cultivars, mainly cultivated in Africa and the Caribbean. They bear numerous smaller corms (cormels) around the central corm and have a firmer structure and a nutty taste (Ecoport, 2010; Onwueme et al., 1994). Taro yields high quantities of energy and protein per ha (Göhl, 1982). It is mainly cultivated for home consumption in Asia, Africa, Papua New Guinea and the Pacific Islands. 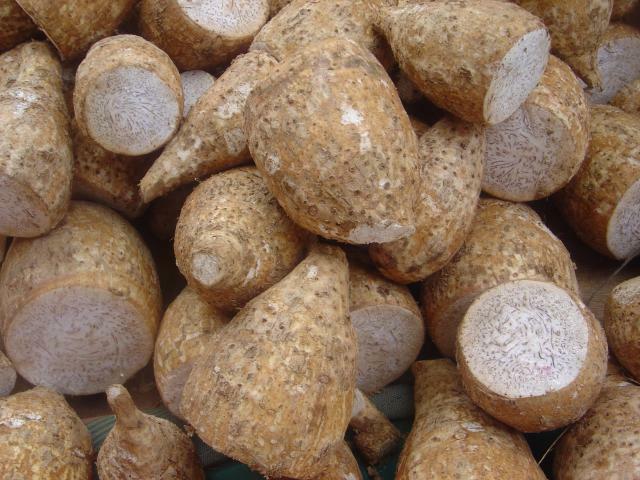 The soft white-fleshed taro corms, usually called taro roots, are highly valued as a staple food and are eaten boiled, fried, roasted, fermented or turned into flour ("fufu" in West Africa), bread and biscuits. Low-grade corms are also used for alcohol production. 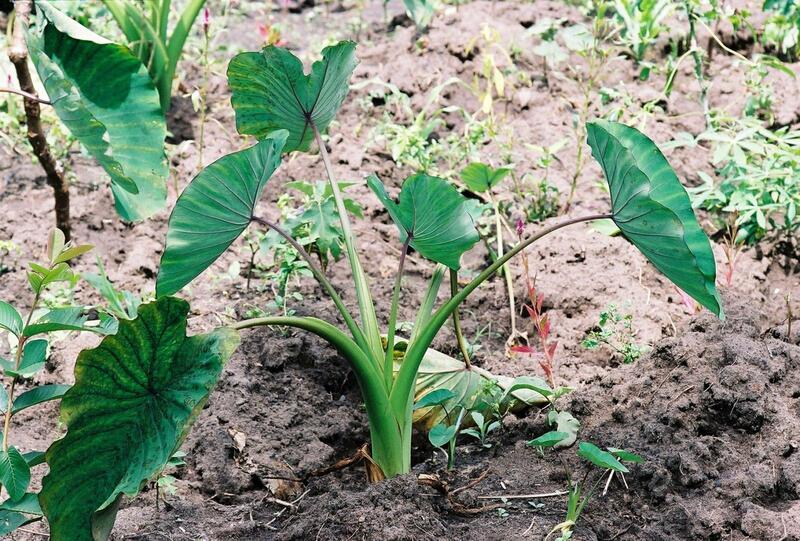 Taro petioles and leaves are used as vegetable (Ecoport, 2010; Safo Kantaka, 2004; Wilson et al., 1996). Taro corms and peelings are fed to livestock, mainly cattle and pigs. In Vietnam, some taro varieties are used only for pigs (Ngo Huu Toan et al., 2010). In Hawaii, taro tops are used to make silage (Onwueme et al., 1994). Taro is native to India and the Malay peninsula, and is now cultivated throughout tropical and subtropical Asia, Pacific Islands (including northern Australia), the Caribbean and tropical Africa (from East to West). It was recently introduced in the southern USA (Onwueme et al., 1994; Ecoport, 2010). Optimal growth conditions are temperatures of 21-28°C, with an annual rainfall between 1800 and 2700 mm. Taro is found from sea-level up to an altitude of 1000 m or, close to the equator, 2300-2700 m (Ecoport, 2010; Wilson et al., 1996). It tolerates a wide range of sunlight conditions, from full sun to shaded conditions in intercropping systems with coconut, coffee or cocoa trees (Safo Kantaka, 2004). Wetland cultivars perform best on heavy soil with high-moisture-holding capacity, and pH ranging from 5.5 to 6.5. They tolerate flooded conditions and some varieties can grow under water (Ecoport, 2010; Safo Kantaka, 2004). Dryland cultivars prefer well-drained, deep, loamy and friable soils. They are drought hardy and tolerate waterlogged conditions and slight frosts (Ecoport, 2010; Onwueme et al., 1994; Wilson et al., 1996). Due to their oxalate content, it is recommended to soak, wash or cook taro corms and dry or ensile leaves before feeding them to livestock (Pheng Buntha et al., 2008a; Babayemi et al., 2009). Ensiling taro leaves with sugarcane molasses (4%) decreased the oxalic acid content from 2.2% to 0.3% on a DM basis (Chittavong Malavanh et al., 2008a). Ensiling with sugarcane syrup (5%) decreased oxalic acid content from 3.08% to 0.11%, although dried leaves contained 1.1% (Pheng Buntha et al., 2008b). Boiling sun-dried taro corms reduced their oxalate, tannin and saponin contents (Agwunobi et al., 2002). Taro can be harvested after 10-12 months in wet conditions (12-15 months in drylands). Usual corm yields range from 5 to 6 t/ha, but a good crop on fertile soil is around 12 t/ha (Safo Kantaka, 2004). Yields up to 37 t/ha have been recorded in flooded conditions in Hawaii (Ecocrop, 2010). Taro has been satisfactorily used as a first crop in the reclamation of saline soils, due to its tolerance to salinity (Onwueme et al., 1994). Taro foliage has a variable but generally high protein content, usually in the 16-27% DM range (Feedipedia, 2011), though lower values (13-16% DM) are also reported. This variability is probably caused by the plant parts included in the foliage since taro tops are richer in protein (more than 20% DM) than the whole plant (less than 10% DM) (Carpenter et al., 1983). Leaves are a good source of thiamin, riboflavin, iron, phosphorus and zinc, and a very good source of vitamin B6, vitamin C, niacin, potassium, copper and manganese (Chittavong Malavanh et al., 2008a). Corms are rich in starch (average 78% DM, range from 61 to 88%) but contain little crude protein (average 5.5% DM, range from 2.3 to 14.8%) (Lebot, 2009). In spite of their potential qualities (protein content of the leaves, starch content of the corms), the use of taro products is limited by their antinutritional content, particularly oxalate. All parts of taro contain needles of calcium oxalate crystals. Taro leaves contain up to 3% DM of oxalates (Duncan et al., 2000). Oxalate crystals cause itchiness to the mouth, throat and digestive tract, and are also responsible for renal toxicity and hypocalcemia, as oxalic acid combines with serum calcium and magnesium. Raw taro forage causes irritation to workers handling it (Carpenter et al., 1983). In ruminants, gradual exposure to oxalic acid leads to changes in the rumen microbial population that mitigates oxalate toxicity (Duncan et al., 2000). See Processes on the "Description" tab for information about oxalate detoxification. Taro contains enzyme inhibitors (antitryptic factors) and saponins. These toxicants are removed or reduced by cooking (Agwunobi et al., 2002; Babayemi et al., 2009; Safo Kantaka, 2004). There is little information available concerning the use of taro corms and leaves in ruminant diets. Taro corms are a potential valuable energy source for ruminants due to their high energy value and medium saponin content (Babayemi et al., 2009). However, due to taro starch being highly degradable and fermentable (Gonzalez-Garcia et al., 2009), taro corms used as the sole source of energy, or in large amounts in the diet could reduce rumen pH, causing rumen stasis, a decrease in forage digestion and intake, and metabolic acidosis. Taro corms should, therefore, be progressively introduced in the diet to allow rumen bacteria adequate time to adjust. Low digestibility forages or fibrous by-products should be avoided in the diet. 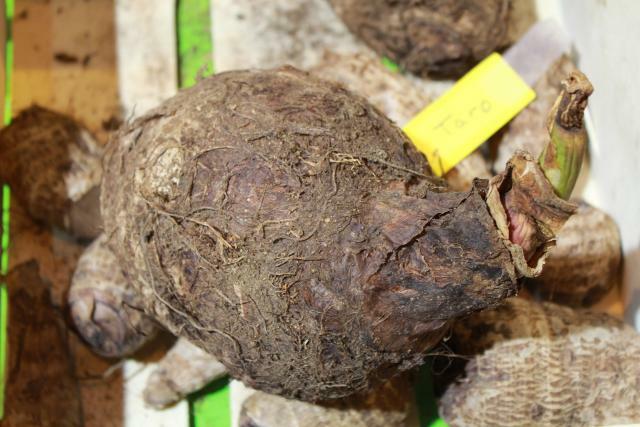 Due to their poor protein content, taro corms should be complemented with a highly degradable protein source in order to provide highly digestible nitrogen and energy to the rumen microbes. Taking into account these recommendations, taro corms could be used in the diets of dairy females (Hassoun, 2010, personal communication). In Samoa, a goat trial found taro corms and taro peels to be potential feed ingredients in goat diets, with taro corms being superior to the peels as an energy source for the kids (Aregheore et al., 2002). Taro corms enriched with single-cell protein may be used in calf creep diets (Anigbogu et al., 1999). Fresh taro foliage is difficult to handle due to its high oxalate content and is usually ensiled to mitigate this problem. Ensiling is also a less energy-intensive method than drying. Several trials were carried out in Hawaii in the 1970s with taro silage. Ensiled taro was found to be very palatable to sheep, goats, water buffaloes and other animals. DM intake in sheep was 326 g/d and in vivo DM digestibility was 54% (much lower than in vitro values). In spite of the high palatability, voluntary consumption was too low for maintenance and the animals lost weight. A very high rumen pH (8.24) was noted for a 100% taro silage diet. In another trial with lambs fed soybean meal with either alfalfa or taro silage, taro silage resulted in much lower intake and daily gain than alfalfa. This may have been caused by the very high moisture content of the silage (90-92%) or by antinutritional substances (Carpenter et al., 1983). Taro leaves might be a valuable protein source, and taro leaf protein is possibly highly degradable. They should be combined with a rapidly fermentable energy source in order to balance energy and protein utilization by the rumen bacteria. Green leaves could be a valuable supplement for low digestibility forages or fibrous by-products (Hassoun, 2010, personal communication). There is little literature on the use of taro corms for pigs. In diets of weanling pigs containing soybean meal, boiled sun-dried corms replaced 100% of the maize grain (30% of the diet) and were found to be comparable to maize as an energy source. Unboiled sun-dried taro corms depressed weight gain and feed efficiency when they replaced 50% of the maize in the diet (15% inclusion rate), an effect attributed to the antinutritional factors in the corms that were not destroyed by boiling (Agwunobi et al., 2002). On average, the digestible and metabolisable energy of taro leaves is about 8.6 and 8.5 MJ/kg DM respectively. The energy and protein digestibility coefficients ranged from 47 to 54% and 34 to 47%, respectively (Régnier, 2011). There is a large body of literature from South America and South-East Asia (Cambodia, Vietnam and Laos) dealing with the use of ensiled taro foliage in pigs. Ensiled taro leaves appears to be more palatable than fresh or cooked leaves (Ngo Huu Toan et al., 2010) but less so than dried leaves (Chhay Ty et al., 2009). The silage is generally obtained by mixing chopped leaves with molasses or rice bran in a closed plastic bag for 21 to 40 days. Taro leaf silage can be fed with concentrates such as rice bran (Chhay Ty et al., 2007; Chhay Ty et al., 2009; Nouphone Manivanh et al., 2011) or fish meal (Pheng Buntha et al., 2008b; Pheng Buntha et al., 2008c). Taro leaf silage is generally considered as a valuable product, but with some limitations due to antinutritional factors: performance of growing pigs was depressed when taro foliage was included above 20 to 30% in the diet (Pheng Buntha et al., 2008c; Du Thanh Hang et al., 2010). The reproductive performance of Mong Cai sows (piglets born alive and weaned, interval from weaning to estrus) was satisfactory when taro leaf silage and water spinach replaced soybean meal. However, piglet weight at weaning decreased, with a linear trend from 35.9 to 25.1 kg as the soybean was replaced by the forages (Chittavong Malavanh et al., 2008b). Raw taro corm meal is not a good feed for poultry and is an inferior substitute for maize. Processing the corms by drying, grinding and boiling increases their nutritive value, but even in the processed form taro corms cannot replace more than 50% of the maize (about 25% of the diet) without depressing performance. Raw taro corm meal fed at 20% or 40% in diets for starting chicks severely depressed feed intake, weight gains and feed efficiency (Fetuga et al., 1976) and a 10% inclusion rate depressed feed intake and growth by 70-80% (Samarasinghe et al., 1992). This growth depressing effect was overcome by boiling the corms and it was possible to include them at 10% without adverse effects (Ravindran et al., 1996; Samarasinghe et al., 1992). The ME value for unprocessed dried corms were 8.7 to 11.8 MJ/kg (Ravindran et al., 1996; Fetuga et al., 1976), while the ME value of boiled corms was in the 11.6-15.0 MJ/kg DM range (Ravindran et al., 1996; Samarasinghe et al., 1992). Boiled sun-dried taro corms replaced up to 50% maize in broiler diets (15% of starter diets, 28% of finisher diets) without negatively affecting performance and nutrient retention. Total replacement of maize depressed weight gain, feed conversion and feed efficiency during the starter phase though carcass characteristics were satisfactory (Isika et al., 2009). In a similar trial, raw sun-dried corms replaced 25% maize (12% of the diet) while broiled corms replaced up to 50% maize (24% of the diet). Live weight, dressed weight and eviscerated weight obtained with the taro diet were lower than for the control, which may be due to the presence of antinutritional factors (Abdulrashid et al., 2009). Fresh taro leaves can meet duck requirements for vitamins and minerals. In Vietnam, silage made from taro leaves and petioles replaced up to 60% of rice bran in diets for growing ducks without any decrease in growth performance and with positive effects on carcass quality (Nguyen Tuyet Giang et al., 2009). However, in Cambodia, supplementation with ensiled taro leaves led to lower feed intake and growth rate in Muscovy ducks. This taro leaf silage was prepared without additives, which may have had a negative effect on the palatability of the feed when mixed with rice bran (Phongphanith et al., 2012). Boiled sun-dried taro corms replaced up to 50% maize (8.4% of the total diet) in the diets of Japanese quails though increasing the level of taro depressed performance (Okon et al., 2007). Fresh taro peels were fed successfully to West African snails with no adverse effects, but they gave a lower performance than papaya peels (Omole et al., 2004).